Is historical memory permanent? Every annual commemoration of the beginning of the Second World War is a heated test of modernity with returning questions of presence, avoidance and acknowledgment of guilt. Architecture is a special carrier of history creating the structures of space, power and memory. Building Memory is a video art project in which four artists: Mirosław Bałka, Yael Bartana (Israel), Deimantas Narkevicius (Lithuania) and Marcel Odenbach (Germany) refer to the problem of places marked by history: buildings, monuments and other silent witnesses of the dramatic events of the last seventy years. The encounter of four artistic personalities from four countries, whose histories bear a particular mark of the 20th century tragedy, was initiated by Marcel Odenbach with the Goethe Institute in Warsaw. The departure point for the German artist's work „Going in Circles” („Im Kreisen drehen”) was the monument in Majdanek designed by Wiktor Tołkin on the 25th anniversary of the liberation of Lublin concentration camp. A giant dome with ashes, as if taken out of the sketches of eighteenth-century French architect Etienne-Louis Boullée rises over the concentration camp. The camera enters the recesses of the monument, making the spectator nauseous and reminding what an uncomfortable experience it is to visit places of this kind. Simultaneously, a simple question is asked by two boys, accidental characters in the film, „when the ashes have vanished will memory vanish as well?”. 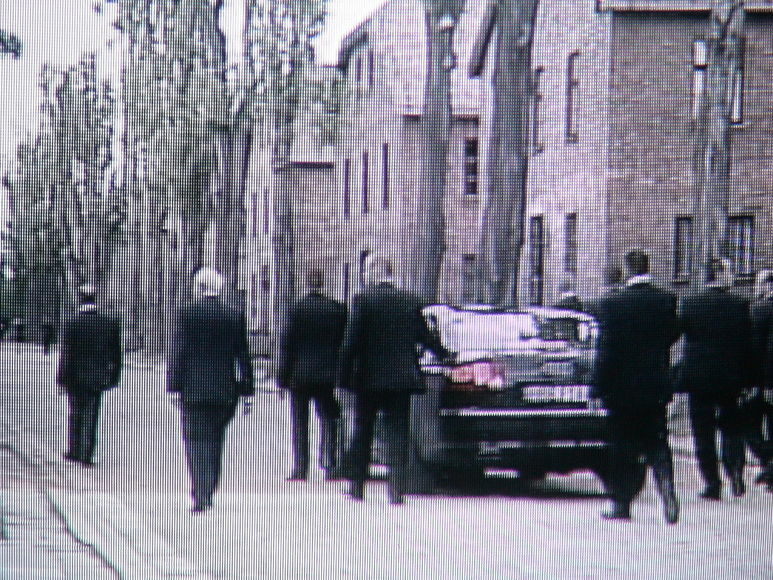 Mirosław Bałka uses CCTV camera recordings which were to cover the visit of cardinal Joseph Ratzinger in Auschwitz. The event was to take place before Benedict XVI commenced his papal pontificate. It is not obvious, however: the mysterious person riding a black Audi HBE F144, surrounded by a crowd of bodyguards never for a moment leaves the car. Bałka leaves spectators with no comments but reflections on Benedict XVI's past that is so different than the past of John Paul II, who fought against the nazi regime. Yael Bartana continues his story about Polish-Jewish relationships with the film “Wall and Tower”. The symbolic call to come back to Poland addressed to the Jews murdered during the second World War, those who emigrated to Israel after the war and those expelled in 1968 is illustrated by a real undertaking of building a kibbutz in Muranow in Warsaw (vis-à-vis the monument of the Heroes of Warsaw Ghetto). The political scenery of the settlement action, a part of Warsaw architectural installation, contains a current dramatic reference to the Israeli-Arab conflict. On the other hand, Polish and Israeli national emblems are composed into one in „wall and Tower” - a gesture of reconciliation. The film „Into the Unknown” by Deimantas Narkevicius is a collage of propaganda recordings of DEFA film studio, presenting the life on the eastern side of the Berlin Wall. The artist edits the scenes and soundtracks together at will creating a unity which is to restore „existential importance” to the trivialised presentations. The exhibition has already been presented at CAC (Vilnus, Lithuania) and after the show in Lodz it will be presented at MedienKunstVerein (Dortmund, Germany). An academic publication related too the theme of the exhibition is planned to be published in the second half of 2010. All films have been created especially to be presented at this exhibition. As a part of the accompanying programme, Marcel Odenbach's lecture will be held (21 may 2010) and a discussion panel will be organised in cooperation with dr. Magdalena Saryusz-Wolska in the first half of May.